The Made-In-Japan sticker is easy to read on this Royal Enfield tricycle. 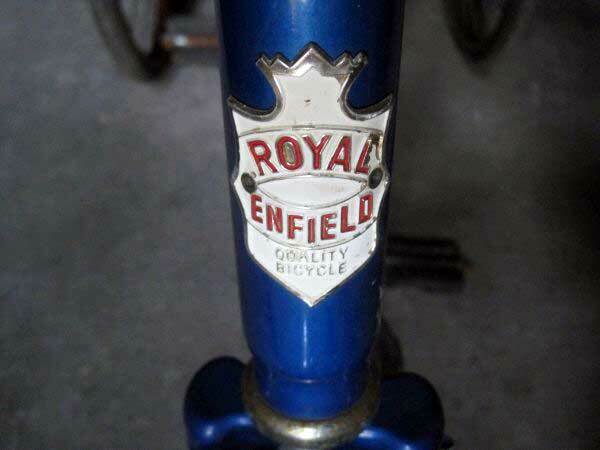 Royal Enfield Quality bicycles so often found in the U.S. today were made in Japan, if you believe the silver stickers still found on some of the bicycles. Now we know the same is true of the tricycles that bear the "Royal Enfield Quality Bicycle" badge on their headstock. The Kansas City, Mo. seller of a Royal Enfield three-wheeler provided a photograph of the "Made In Japan" sticker in his ad. Obviously, he considered it a selling point. This same seller asserted that his tricycle was produced by the "same company that made the Royal Enfield motorcycles." That is not true. Royal Enfield tricycle was built in Japan. Royal Enfield push bike construction at Redditch, England ended in the late 1960s as did Royal Enfield motorcycle production there. Motorcycle production in Madras (Chennai), India continued after Redditch closed but the Royal Enfield brand name for bicycles traveled to a Birmingham firm and then overseas. Carine Joannou told us that her family's G. Joannou Cycle Co., based in the U.S., held the trademark for Royal Enfield bicycles from 1975 through 1977 and imported the bicycles and tricycles. Without checking old records it was her recollection (she was a teenager at the time) that they were produced in Taiwan. Tricycle bears the Royal Enfield Quality Bicycle badge. The stickers say Japan. Close enough. This blog is proud of having pursued this minor historical point endlessly, wrestled it to the ground and crushed every last drop of interest from it. My apologies for boring readers with this. Just wanted to set the record straight. I'm confused, I just acquired a Royal Enfield Tricycle with the crest on the front, and a silver "Made in Japan" sticker on the lower level. Are these "counterfeit" Royals of any value? They're not counterfeit. They are exactly what they are. The brand name seems to have been used legally at the time they were made. They are not related to the old Royal Enfield company of the UK or the existing one in India. 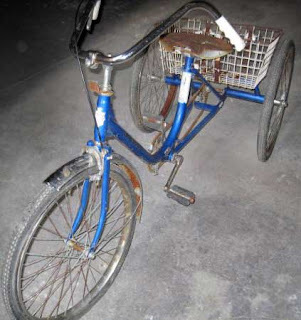 But they apparently are well built and, in good condition, they bring a good price as tricycles are not cheap to buy. But they are not collector's items. Enjoy yours for what it is. Do you know a price range on these things ? Hello, I now have a Royal Enfield Trike just like the blue one in the picture above. I have overhauled the crank bearings and replaced the front wheel. I have also greased and repaired the drive side rear wheel. My questions is that during trying to work on the free wheel side rear I found that the last person that had it put it back together without the outside bearings and that has messed up the axel some. Where can I find the vintage style bearings that go for this model as I had only seen this double cage style once when I was very young? We know that all the Royal Enfield pedal tricycles were made in Asia, if not necessarily in Japan. They were imported into the U.S. in the 1980s by a U.S. company that briefly had use of the Royal Enfield name. There is no relation to the Royal Enfield company that makes motorcycles in India, or the Royal Enfield company that once existed in England and made bicycles and motorcycles. I've written more here. My Royal Enfield trike has 20 " front drum brakes with chrome forks that are stamped " Royal Enfield on the tube just below the threaded section. The rears are 24" and the trike is a 5 speed deraileur that appears original. People ask anywhere from $300 to $80 from what I've seen in the ads, but there is no telling from the ads how much the bikes actually sell for. The market determines. Start with a high price and come down step by step until it sells.